Helpful information toward a better understanding of the calendar systems in Ancient Kemet. Unlike today’s dating methods where we count the years in sequence from a fixed historical point, the Remetch began calculations from a king’s ascension to the throne. Using this system in the United States of America, we would refer to the year 2016 AD as “Year 8 of President Barak Obama” rather than 2016. The dating method was commonly expressed in the form of: the year ￼￼ ￼followed by the number, the month followed by the number, the season followed by the name, the day, and the royal titulary which includes the name of the king. 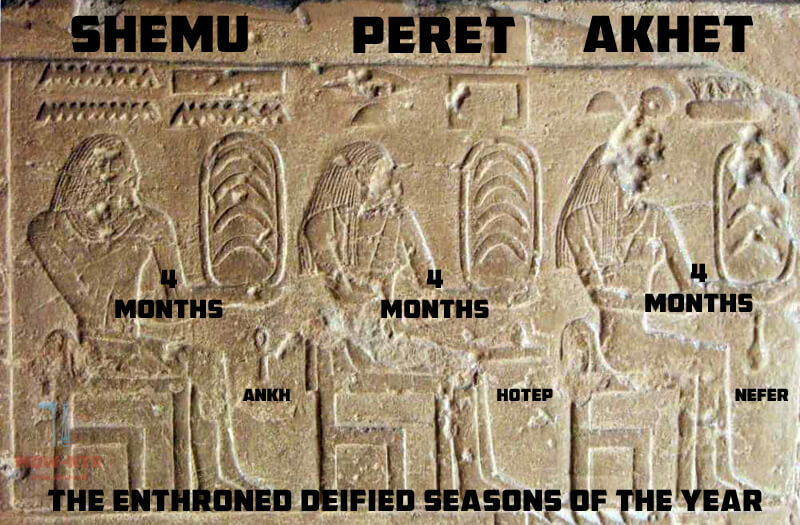 The year ( , rnpt, ‘renepet’) was divided into three seasons ( , tr ‘ter’): (1) Axt ‘akhet’ « inundation » (2) prt ‘peret’ « emergence » and (3) Smw ‘shemew’ « harvest ». The quality of harvest depended on the annual inundation of Hapy ‘Hapy’ « the Nile River » which corresponded to the heliacal rising of spdt ‘sepedet’ « Sirius Star ». Sepedet is visible in the Nykemet night sky for most of the year, but during a period of about seventy days in late spring it does not rise above the horizon; then, in mid-July, it reappears above the horizon just before sunrise. This event occurred once every solar year and was called prt spdt ‘peret sepedet’ « emergence of Sepedet ». The year began on the first hrw ‘herew’ « day » of the first Abd ‘abed’ « month » of the Axt ‘akhet’ « inundation » season. The first day of the year was called wpt rnpt ‘wepet renepet’ « opening of year » and was celebrated with a festival called wpt rnpt Hb ‘wepet renepet heb’ « opening year festival ». 12 wpt-rnpt Opening of the Year. This combination of seasons, months, weeks, and days resulted in a year of 360 days however, the Remetch knew the full year consisted of 365 days. Five more days were added to the end of the year which was after 4 Smw 30 and before the beginning of the year which was 1 Axt 1 to compensate for the discrepancy. These fives days were called 5 Hryw rnpt ‘5 heryew renepet’ « the 5 over the year ». Egyptologists call these days, Epagomenal (added) days. Each of these days was celebrated as the birthday of a particular divinity: (1) mswt wsir ‘mesewt wesir’ « birth of Ausar » (2) mswt Hrw ‘mesewt herew’ « birth of Heru » (3) mswt stx ‘mesewt setekh’ « birth of Set » (4) mswt Ast ‘mesewt aset’ « birth of Auset » and (5) mswt nbt-Hwt ‘mesewt nebet-het’ « birth of Nebt-Het ». The first of the year also being celebrated as mswt ra ‘mesewt ra’ « birth of Ra ». This constituted the 365 day Civil Calendar. Each day was divided into 24 hours ( wnwt ‘wenewt’) with 12 for the day ( hrw ‘herew’) and 12 for night ( grH ‘gereh’) with the day beginning at sunrise. The difference between the words sw ‘sew’ « day » and hrw ‘herew’ « day » is the latter deals with the literal daylight hours and the former deals with a complete 24 hr cycle used in dating formulas. Hours may be further divided into moments or minutes called At « moment ». There were two calendars in use throughout the history of Kemet: The Civil Calendar and The Religious Calendar. The civil calendar functioned mainly for administrative purposes. The Civil year was called annus vagus (“the wandering year”) by the Romans because of its characteristic feature of wandering across the seasons. There is no correspondence between the “seasons” of the Civil calendar and the natural seasons. In fact the Civil year is not always fixed to the same days nor to the same seasons, but it goes backwards across the natural seasons (and also across the Religious calendar), due to the difference of days with the cycle of the sacred star Sirius/ Sothis. The civil calendar was based on a year of 360 days with five added days inserted between the end of one year and the beginning of the next. There were ten days to a week, three weeks to a month, four months to a season, and three seasons to a year. The dating method was commonly expressed in parts: the year, the month, the season, the day, and the royal titulary which includes the name of the king. In this example we have: HAt-sp 2 “regnal year 2,” Abd 2 Axt “second month of inundation season,” sw 15 “day fifteen.” The remaining signs represent the Royal Titulary. Apr 5th 2016 is the last day of the year according to the current Kemety Civil Calendar cycle. Apr 6th 2016 is the Birth of wsir/Osiris according to the current Kemety Civil Calendar cycle. Apr 7th 2016 is the birth of Hrw/Horus according to the current Kemety Civil Calendar cycle. Apr 8th 2016 is the birth of stx/Set according to the current Kemety Civil Calendar cycle. Apr 9th 2016 is the birth of Ast/Isis according to the current Kemety Civil Calendar cycle. Apr 10th 2016 is the birth of nb-Hwt/Nephthys according to the current Kemety Civil Calendar cycle. Apr 11th 2016 is the first day of the New Year and the beginning of the 417th year within the Great Year of Ra according to the current Kemety Civil Calendar cycle. Jul 24th 2016 is the day of the Heliacal Rising of Sepedet (Sothis, Sirius Star) at mn-nfr Memphis.